This woman underwent complete facial rejuvenation. She had a facelift, browlift, upper and lower blepharoplasty, fat transfer, and laser resurfacing. Oculoplastic Surgeon Dr. Christopher Zoumalan performed the eyelid work. 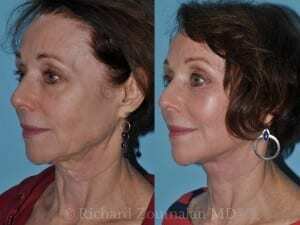 Her deep-plane mini-facelift created a natural result which lasts longer. This technique tailors each surgery to the individual, as well as decrease the healing time. 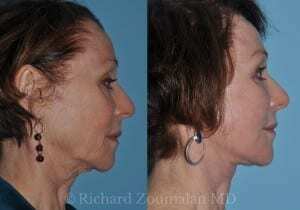 In her case, you can see improvements in her neck and jaw line. It is smoother, and more defined. 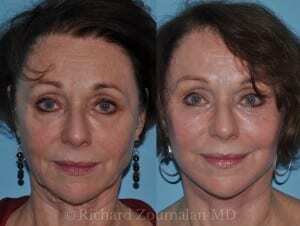 Her deep-plane mini-lift has given her a younger more youthful appearance. 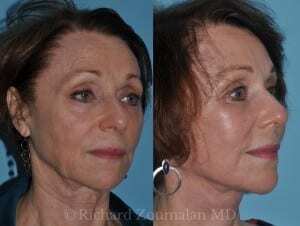 The laser resurfacing made her skin smoother by stimulating collagen growth.